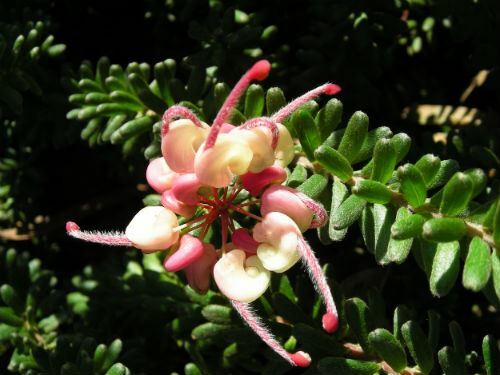 This plant is a compact form of Grevillea lanigera which has been widely grown and available in plant nurseries for many years. Interestingly, this plant does not originate from Mt Tamboritha (a 1840 metres high mountain located on the western edge of the Victorian Alpine National Park). However while there is a form originating from Mt Tamboritha, it is not readily available. I have been growing these plants for many years (in my garden in the northern Sydney suburb of Westleigh) and I find the flowers and foliage very attractive. 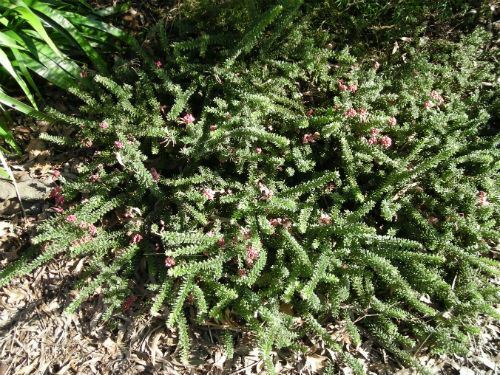 They make an excellent compact ground cover as they grow to about one metre (or less) in diameter to about 20 cms high in situations with full sun to partial shade in fairly well drained soils. Its attractive grey/green foliage is a good colour contrast to its flowers, and is best shown if planted in groups of three. For those of you living in areas that receive heavy winter frosts, this plant is frost tolerant to at least -11°C. Overall, a great native plant that should be grown in every garden. Grevillea: Charles Francis Greville (1749-1809) who was one of the founders of the Horticultural Society.